After eating a delicious concoction that my sister-in-law dubbed Avocado Brucshetta, I've been obsessed with the lovely green fruit, mixing it with all kinds of things. In my effort to recreate the essence of bruscshetta, minus the gluten filled toast, I found PW's Fresh Corn & Avocado Salsa. But seriously, no garlic? One can't make something called salsa without fresh garlic. So I added fresh garlic, didn't use red onion but sweet onions, and...well, shoot. I should just give you the whole recipe with the changes. 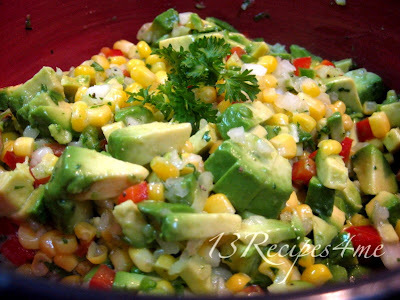 But, then I made fresh corn and avocado "salad." Sure, you can eat it with chips if you want, but it seems healthier as a salad. Mix dressing ingredients. Place corn, peppers, onion, & tomato in bowl. Add dressing and mix. Refrigerate if not ready to eat. Right before serving, add chopped avocado and almonds. This can be served atop thinly sliced lettuce. To toast almonds, I do the same as for toasted pecans or other nuts. To serve as a main dish, add sliced, grilled chicken and top with toasted almonds or even walnuts. For salsa: omit olive oil & almonds, add 1 TBS vinegar and a tomato or two. PW uses 4 ears of corn for hers. I MUST try this one. WOW!